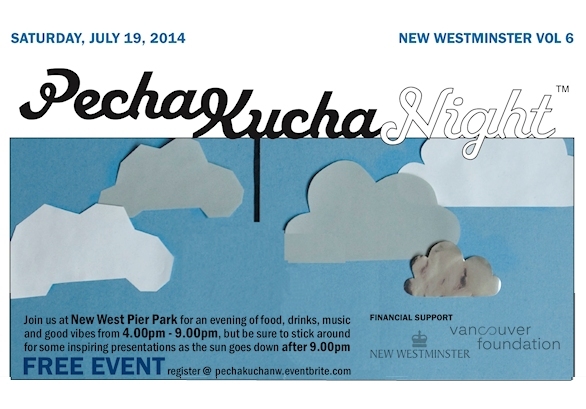 The upcoming PechaKucha event will be on Saturday July 19th, 2014 at Pier Park. The presentations will start at approximately 9:00 pm, with 10 presenters delivering their inspiring talks with the Fraser River, Pattullo Bridge and Golden Ears mountains as the backdrop. Vancouver Biennale Marketing Director Miriam Blume is one of the presenters. Be sure to bring your chairs, friends and blankets – trust us, it gets a bit chilly, for what will certainly be one of the most memorable nights of the summer. The event is free to public.